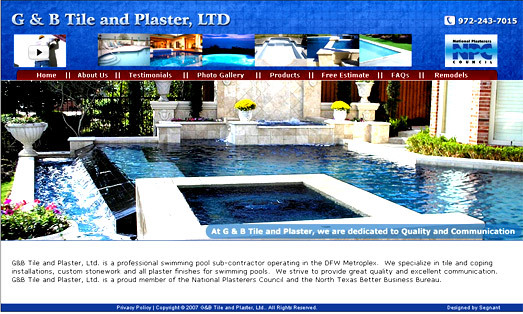 G&B Tile and Plaster, Ltd. is a professional swimming pool sub-contractor operating in the DFW Metroplex. We specialize in tile and coping installations, custom stonework and all plaster finishes for swimming pools. We strive to provide great quality and excellent communication. G&B Tile and Plaster, Ltd. is a proud member of the National Plasterers Council and the North Texas Better Business Bureau. 1. Dynamic Gallery: Users can view photos of completed work. 2. Dynamic Testimonials: Testimonials can be updated regularly by the admin. 3. Free Estimate: Users can submit a form to the admin to receive a free estimate. Segnant has given G & B Tile and Plaster the calming look and feel that was requested and made the whole process of finding the right services related information not only easy and hassle free, but also interesting and colorful with use of great graphical layouts.